The Boeing KC-135 Stratotanker is a United States aerial refueling tanker aircraft. It has been in service with the United States Air Force since 1957; it is one of six military fixed-wing aircraft with over 50 years of continuous service with its original operator. It and the Boeing 707 airliner were developed from the Boeing 367-80 prototype. 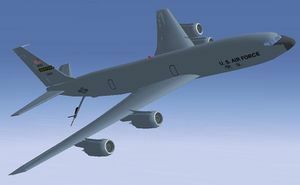 The KC-135 was the US Air Force's first jet-powered refueling tanker and replaced the Boeing KC-97 Stratofreighter. It was initially tasked to refuel strategic bombers, but was used to extend the range and endurance of US tactical fighters and bombers. and it is supplemented by the larger KC-10. The KC-135E is the only user-controlled tanker aircraft available in FlightGear at the moment. The maximum fuel load is 200,000 lb (90,719 kg) or 31,275 US gal (118 kL). The boom will extend automatically when the aircraft's gear is retracted. Perhaps a development on the Aircraft Help? This page was last modified on 24 July 2016, at 12:30.